New Yorkers are in for an exciting moment in history, poised to make a major contribution to the generations that come after us. 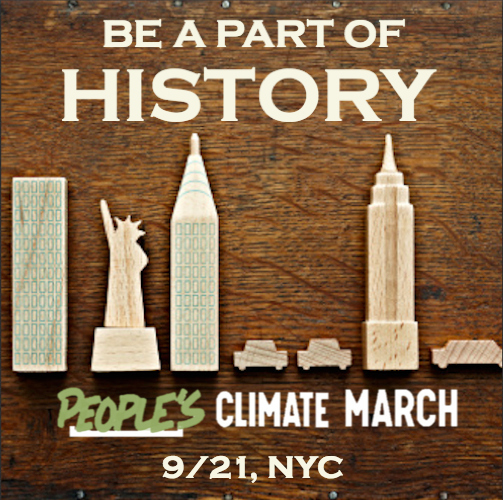 The People’s Climate March is gearing up to be a massive march in support of sustainability and environmental justice. It will be a clear message to the United Nations that the world’s people– represented in the cosmopolitan city of New York– are forming a bona fide social movement. People want to live on a safe, clean planet. They went to face up to the debt of industrialization and make the hard decision to stop, and hopefully reverse, the adverse effects of climate change. Last month, Robert Jay Lifton wrote in the New York Times that what we are experiencing is part of an American “climate swerve.” Lifton, a psychohistorian best known for his work on the trauma in the aftermath of the dropping of atomic bombs on Japan, has likened the new consciousness in America about climate change to the social movement around nuclear disarmament in the 1980s. It is a swerve toward a popular engagement with the ethical, economic, and political considerations of the man-made phenomenon of global warming and all its devastations, past, present, and future. It is a swerve that hopes to call out climate change deniers and put pressure on politicians to think urgently and creatively about solutions. In the days leading up to The People’s Climate March, the SEJ faculty have been wowed by the sheer number of events– from symposiums to film screenings– that will be happening in the week leading up to the march. Our events page has showcased some of the ones we are involved in, on campus or off, or find particularly interesting or important. But our little website has not been able to capture the sheer magnitude of events in the city, so check out this events calendar for all the possibilities.